The first Wednesday of every May, millions of children worldwide celebrate physical activity in unison. Although separated geographically, millions of kids run, walk, dance, or play active games all at the same time. This is ACES day — All Children Exercise Simultaneously. In 1989, New Jersey physical educator Len Saunders had an idea for an event, a celebration with a bigger message behind it. This event became ACES. It was small at first but has grown to become, first, a national event and, now, an international phenomenon. It’s fun, it’s healthy, and it conveys a message not only to the school children involved but to larger communities and to the entire world that physical activity is a must have component to long, healthy, and happy lives. In Michigan alone, 300,000 children from every county in the state participated last year. Some ACES events were hosted at large venues like the Michigan State University stadium or the “Big House” on the University of Michigan campus. Participating schools plan a physical activity event on ACES day. 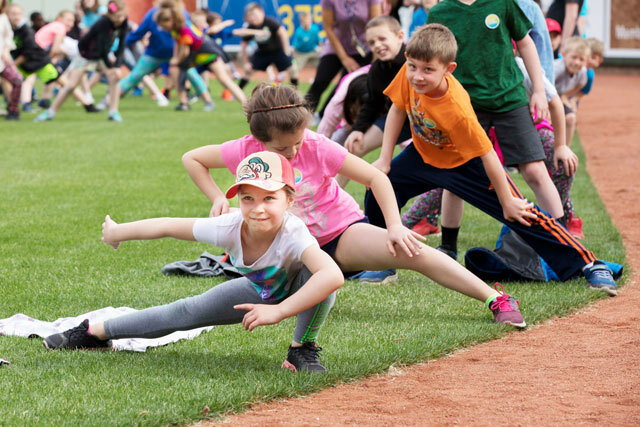 These events range from walking parades to aerobic dance sessions to field day games and more. The type of physical activity is unimportant and intentionally so. ACES is meant to represent the vast variety of physical activities that people can choose from to remain healthy for life. Participating schools and event organizers are encouraged to get creative: Play music. Run relays. Organize jump rope stations. Choreograph dance or aerobics. There really is no limit to what schools can decide to do. The goal is to impart to children the importance of physical activity for life. But that’s a message that’s not just for kids! ACES day also presents an opportunity to reach beyond the school and to involve the entire community in something fun and positive. In Michigan, some schools have made ACES a community-wide event. Radio stations, community leaders, elected officials, local sports teams, and local businesses can all get involved. ACES is organized by the Michigan Fitness Foundation (MFF) in partnership with Farm Bureau Insurance. To learn more, to get involved, and to download a tool kit of useful resources that can help you plan —or launch — an ACES day event, please visit the ACES page.